The footpaths in the field by Tyrells End, next to Rush Hill and Helford House, were changed by Central Beds Council in 2015 – 2016. The definitive map, poorly defined, did not agree with the facts on the ground. Emrys Williams, resident of Helford House, wrote an article about it for About Eversholt, and here it is. Q: How do you move a public footpath? We bought our house, Helford House in Tyrells End, in 1994. I remember checking the Ordnance Survey maps at the time for public footpaths, and discovering that a footpath maybe went through a far corner of the front garden. The maps seemed strangely imprecise, everything moving about a bit depending on which map was consulted, but even if some pedantic person insisted on following the official line of the footpath on the map, it was only a couple of metres in the corner. The actual used path went along the driveway to the Notts’ house next door, Rush Hill. I wasn’t too bothered about the possibility of ramblers beating a path through our hedges. The footpath was originally surveyed in detail by Ordnance Survey in 1882. The line drawn on the map then did indeed pass through what is now our front garden. All the land then was fields, no houses in sight. It all belonged to the 9th Duke. 31 years later, the 11th Duke of Bedford had our houses built, providing fine housing for four families of estate workers. The houses were a standard terraced block to the Duke’s standard design, with a front garden, and the doors round the back. The front garden was enclosed by a hedge, and the footpath pushed aside a few metres back into the fields. Nobody was going to tell the Duke of Bedford that he couldn’t move a footpath a few metres on his own land to make way for his own houses for his own estate workers. From all that we can tell, it was 1913, when the houses were built, that the footpath was moved. All went on very happily, the footpath in its new position serving perfectly well, and the houses with their new front gardens growing cabbages perfectly well for the war effort. There was sweetness and light for about 50 years. In about 1960, the 13th Duke sold off land to W C Williams, property developer (and no relation! 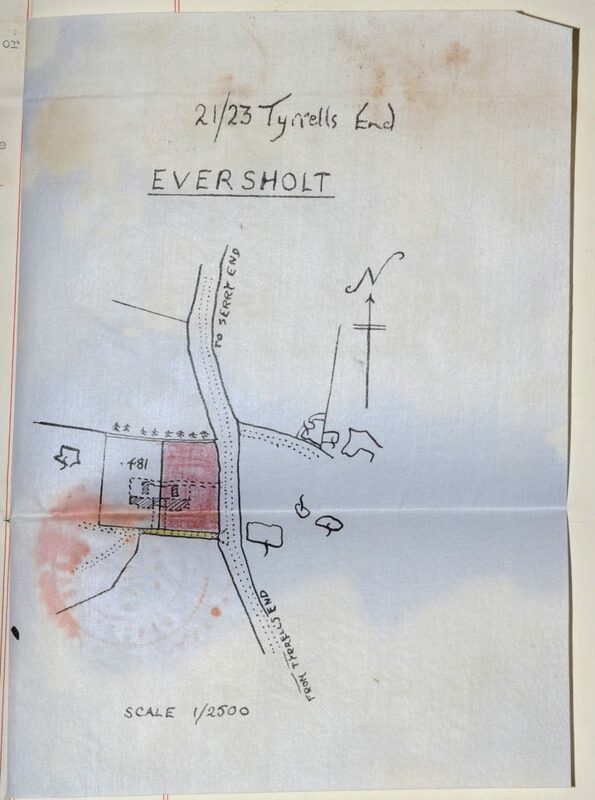 ), who created a shooting estate around his big country house, Berrystead. This included our houses, still a terrace of four at that time, and the surrounding fields. Nobody worried very much about public footpaths. The land they sold had public footpaths all over it, there were hundreds of them. In about 1970, W C Williams sold off two pairs of terrace houses to private buyers to create two larger semi-detached houses. These have now become Helford House and Rush Hill. Again, nobody worried very much about the public footpaths. The detailed maps produced for the sale by W C Williams’s lawyers showed the public footpath passing up the driveway of Rush Hill and through the fields, not through the front gardens. This was to W C Williams’s advantage, because he’d not have been able to get as good a price for the houses if they’d had public footpaths through the gardens. For everyone concerned, it was better that the footpath passed along the driveway to Rush Hill and then through the field. Time marches, or perhaps dawdles, on to 2004, ninety-some years after the houses were built and the footpath shoved aside. The Notts of Rush Hill became aware that the official line of the footpath on the definitive map passed through their front garden. This had no practical effect, no rambler had ever appeared there, nobody had ever complained the path was in the wrong place. However, one day, they’ll want to sell up, and some officious person will raise the matter, and it will take endless legal wrangling to clear up. It never had caused problems in the past, but all the deeds for house sale had been based on the 1970 maps created by W C Williams’s lawyer. Future sales would be based on maps from the Land Registry, and things are looking more formal, and it will become more important to have the formal record agree with the facts on the ground. So, the Notts wrote to Beds County Council asking if the official record could be corrected. That is when things started to become interesting. The Notts were told that usually a landowner making an application for a footpath diversion could expect to be charged up to £2000, to cover the Council’s work doing consultations and a detailed report. If there are objections the lawyers can get involved, and this sum can multiply several times over. However, if the Council Footpaths Officer agrees that a change is in ‘the public interest’ the Council will undertake the work free of charge. He felt that the public interest case applied here, as confusion would reign if the path took a route through obviously private gardens when there is a long established alternative route a few yards away. Moreover, there were several other anomalies throughout the path network in the neighbouring field, together with the some uncertainties about the definitive map, and a Council application could resolve these at the same time. Beds County Council had discovered that the definitive map was not as definitive as might be wished. The problem was not the 1882 map showing the footpath, but the later map showing the location of the Duke’s terrace of houses. The houses were not accurately surveyed until the 1970s. For over 60 years, the definitive map had shown the wrong alignment between footpath and houses. That explained why, when I checked the maps in 1994, they seemed oddly variable. Different maps showed different surveys. This was a matter of some embarrassment for the council, potentially creating legal confusion. It was becoming in everyone’s interests to get this sorted out. In 2009, with not much progress made, Beds County Council gave way to Central Beds, which took over administration of public footpaths. Central Beds agreed to take over responsibility for trying to move the definitive route of the footpath to the practical route on the ground, to remove the anomalies caused first by the 11th Duke moving the footpath without telling anyone, then by the council using the Ordance Survey maps that weren’t all they might be. This was potentially a big step forward, because at least the council had some idea how to go about it. The fields owned by W C Williams were inherited after his death by Eversholt Estates. Although the Estate had no objection to the changes that rationalized the footpath routes through their field, they did lodge an official objection to the change of the section that cut through Helford House and Rush Hill gardens. They wanted this reinstated, as otherwise there would be a ‘loss of agricultural land’, the 20 metres of field verge that had been used as the footpath for the last 100 years. The objection automatically meant that the council’s proposal to align the definitive map with the route on the ground would have to go to a formal vote at the council’s development management committee. Central Beds Development Management Committee is a fairly grand affair, making rather important decisions. It’s the committee that decides whether a new housing estate can be built. All the decisions it has to make are contested by someone who doesn’t want them to go ahead, and the decisions are often difficult, really hard human decisions. Someone is always going to be unhappy. Because it’s quite important, it has well-defined formal procedures. It’s the same committee that would decide if someone wanted to build a nuclear power station here, so it has to have things really tied down tight. That was why the document proposing to change the definitive map ran to forty-four subclauses. What effect would it have on human rights? Does it affect any gas mains? Is it a sustainable development? All defined in extraordinary detail. Thank goodness it was Central Beds writing this! We were very fortunate that the old maps were poorly surveyed, which is why Central Beds wanted to regularise the situation. Notices were sent out, maps marked up, the formal meeting scheduled, and… postponed. There was a scheduling error and we had to wait a couple of months for the next committee meeting. It was finally scheduled as agenda item 17 on the meeting of 14 October 2015, to be held at the council offices, Chicksands. I decided to go and speak in support of the proposal. Members of the public can go and have their say on any item before the committee, by prior arrangement with the secretary. You get three (3) minutes. With a little clock. The committee visits all the sites to be discussed, two days before the meeting. They go round them all very efficiently in a minibus. They take photos. In due course, fifteen councillors and others turned up in the driveway at Rush Hill to look at twenty metres of contested footpath on the edge of a muddy field. They hummed. They harred. They took notes. They got muddy boots. They went away again. I turned up at Chicksands after lunch on the 14th. It’s not possible to predict exactly when each item will be discussed, and it turned out our footpath was actually going to be last, about 4 pm. I sat in the meeting, in what must be the main council chamber, to watch everyone else. It was fascinating. The meeting is quite a high-tech affair. It’s all recorded on video, and live-streamed on the web. You can watch the video online now, it is all archived and indexed on the council’s website. In the hall, there are three big video screens, so everyone can see the maps and plans and photos as they’re being discussed. Everyone has a microphone and it was easy to follow. There’s a special little desk where members of the public sit to speak. The whole thing was run with a firm but gracious hand by the chairman, and I thought everyone had a proper chance to be heard. Every decision was going to be more important than our footpath, and some would change the lives of the people involved. None of it was easy, and I could see the members of the committee listening to the evidence and changing their minds and eventually coming down one way or another on these difficult choices. I was impressed at how thorough they were and how seriously they took their responsibilities. Finally, it was our turn. The council officer who’d prepared the proposal introduced it. The committee members made some points. Then it was my turn, and I was invited up to the lectern to have my say. I made my little speech putting a human viewpoint that couldn’t be included in the 44 subclauses of the legalese, and ended by urging the committee to support the proposal. In less than three minutes. I was asked whether we’d ever, in twenty years, found a confused rambler in the front garden; no, I said. The final vote was nine-nil to approve the proposal, making the definitive map reflect the situation on the ground. Success! A decision! After only a hundred and two years! Someone commented that at least this was one occasion when the decision of the committee seemed to agree with common sense, and the meeting broke up in good humour. I think it was a relief for the members to have to decide only on the precise route of a footpath as opposed to building developments changing whole villages. I’m pleased all this has been sorted out. I’m pleased there won’t be yet more legal fuss next time our house is sold (anything to avoid fuss!) and I’m pleased that the definitive map will properly document the practical path on the ground, further reducing the small risk of finding confused ramblers in our front garden. And I’m pleased the council takes these matters seriously and seems to have a good process in place, even if it’s impossible for everyone to like what they decide. So, if you want to move a public footpath, you’d better have either deep pockets, or a good argument, a century or so of evidence, at least fourty-four subclauses in your proposal, and a great fund of patience! For the record, here is the report the Council prepared. This was the document considered by the committee. 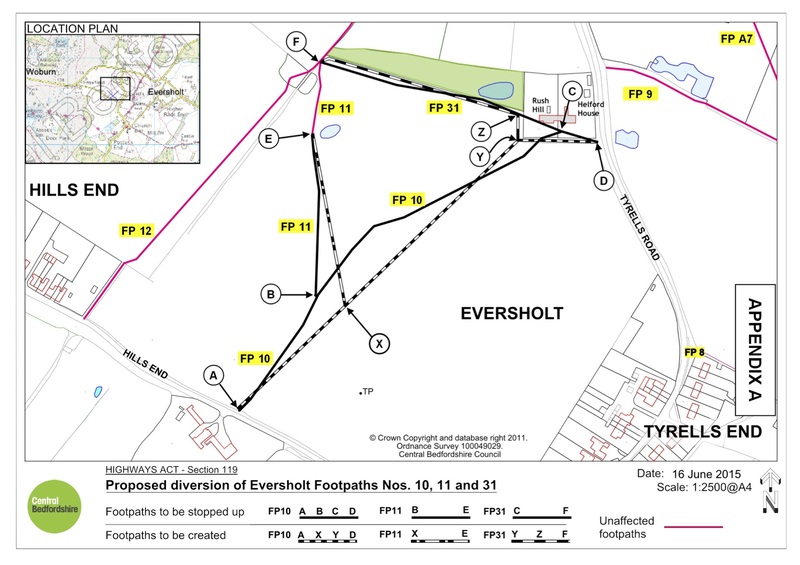 The Diversion of Eversholt Footpaths Nos.1011 and 31.